"...Eight days after the storm struck, the roads were passable enough for me to approach the area where my boat had been secured.. ..To get to where I had left the boat in Discovery Bay, I would have to row down the bayou in my dinghy.. ..It was frightening to think what I might find out there. At the time, hundreds of people were still missing, and bodies were turning up everywhere. 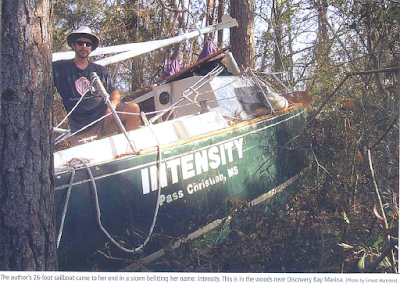 I rowed the dingy through a maze of obstacles--sailboat rigging, overturned hulls and downed trees blocking the waterway. I scraped across something solid just under the surface. It was the cabin top of a sunken sailboat, about the size and shape of mine. I looked closely into the dark water but was relieved to see that this boat was not Intensity. I passed dozens of vessels I recognized. None had survived. They were tossed ashore or half sunk, dismantled, broken up or holed. I made it to the main marina basin and saw that Intensity was missing, just as I had expected.. ..I rowed along the various waterways connected to the marina and found no sign of my boat. I grew increasingly uncomfortable in the unnatural silence, so I gave up the search after a couple hours and returned to the truck.. ..I waited a couple months before launching a kayak, to stay out of the way of clean-up crews and search-and-rescue teams and to comply with boating restrictions imposed by the U.S. Coast Guard and local authorities. When I finally started paddling again, I set out to explore all the bayous around Discovery Bay. After searching the waterways in my kayak to no avail, I decided to continue on foot across the expanse of marsh to get to the dense woods across from the marina. As I made my way around a clump of ravaged pine trees, I spotted my boat. Intensity was wedged between two tall pines, her keel and rudder buried in the mud, mast and rigging hanging from branches high overhead, and her companionway and hatches broken open by looters who had taken many of my valuables. The boat was a total loss..."
Prior to the publication of the above article, Scott had sent an email to Ken Corbett, the founder of grampianowners.com; Dated September 22, 2005, His message began by saying..
"I just found my boat yesterday after spending the afternoon wading through the marsh and hiking the forest surrounding the marina where it was secured before the storm. Unfortunately, it's stranded high and dry about 40 yards from the nearest water and wedged between two large pine trees. Those hulls must be tough. There's not a crack in the hull or deck anywhere,..."
Although sadly, his boat was a total loss, the fact which stands out to me is that the hull and deck had actually survived being thrown into the forest and wedged it between two trees by a full force hurricane .. Well, that is one great testament to the structural integrity of a Grampian 26! "..children can do fine on some cruising vessels under 30 feet. 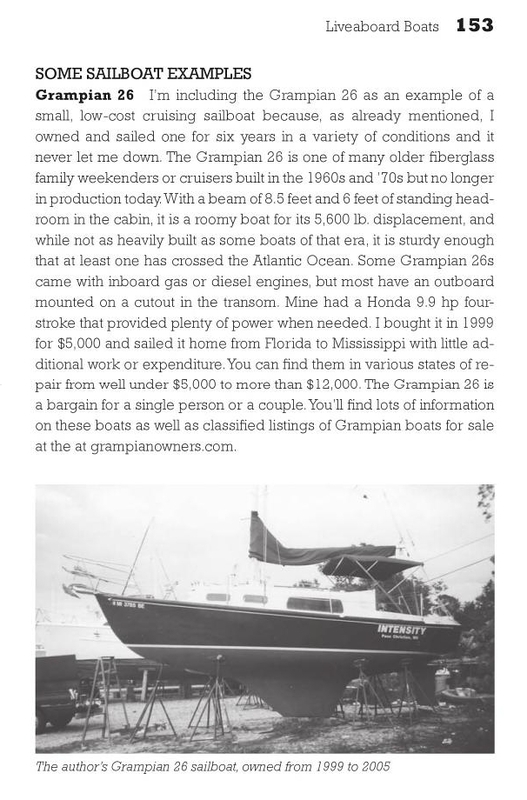 I was able to live comfortably enough on my Grampian 26 sailboat with two other people for a few months.."
I've had a few brief correspondences with Scott Williams, and there was something particular he said in the review above that caught my attention.. So I asked him about it.. I address that subject in another post, along with his reply. Perhaps it caught your attention too?